some information and assumptions that need to be contextualized. The ad ran in two parts, on both sides of 24 Hours‘ front page. The first page of the ad is a graphic that suggests planets orbiting in outer space. The “7% average of recent public sector settlements”, in a large green “planet”, is apparently in orbit in an area labeled as the “affordability zone”. The BCTF’s demands, in a much smaller and bright red “planet”, are in another orbit outside that zone. The planet in the “affordability zone” contains the names of 20 different public sector occupations for which collective agreements have recently been settled. The graphic doesn’t specify whether the agreements for these occupations are in the provincial public sector or with other public sector employers in BC, such as municipalities and regions – but let’s assume that they are provincial public sector settlements. The graphic might give the impression that almost every public sector union other than the BCTF has settled a collective agreement with an average salary increase of 7%. However, the government’s own information on the progress of public sector collective bargaining shows that 54% of all public sector collective agreements have not yet been negotiated under the current “Economic Stability Mandate”. (Full disclosure: the union I belong to is one of the public sector unions currently engaged in negotiations.) So clearly not all public sector unions have agreed to contract terms falling within the “affordability zone”. The public information on the “economic stability mandate” also states that while settlements are to be “affordable”, they are also “expected to be unique between sectors” – which implies that there is some flexibility in what contract terms can be reached, depending on the type of workplace and occupations the contract will cover. 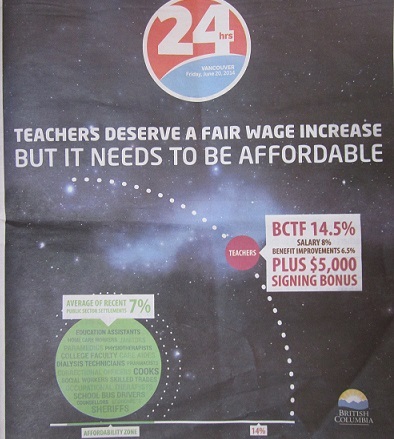 The BCTF’s wage increase demand is presented in the ad in large type as “14.5%”. This figure is then subdivided in smaller type as “salary 8%” and “benefit improvements 6.5%”. The $5,000 signing bonus also mentioned in the graphic could be interpreted as a request for money on top of the total wage increase, but according to the BC Public School Employers’ Association, the $5,000 signing bonus is being requested in lieu of a wage increase in the first year of the contract. The graphic doesn’t indicate whether the 7% average figure for the other public sector settlements is for salaries only, or for salaries and benefits. But if the 7% figure is for wages only, then the BCTF’s proposal for an 8% wage increase is not far off that average figure. And, as indicated by this bargaining bulletin about another provincial public sector collective agreement, other public sector unions are also receiving benefit improvements in addition to wage increases. Since the 7% public sector wage settlement in the ad is presented as an average, it’s also worth noting that some provincial public sector unions have settled agreements with wage increases higher than 7%. For example, in 2013 the 9,000 unionized employees of BC’s community living societies, which provide services to adults with developmental disabilities, ratified a contract with a potential 11.5% wage increase over five years. (Some of the wage increases are dependent on the results of a “labour market adjustment review” for particular job classifications.) So the provincial government has negotiated at least some collective agreements with wage rates within the range of the BCTF’s current wage proposals. Also, settling for a particular wage increase in negotiations should not always be interpreted as endorsement of or agreement with the amount of the increase. One side in the negotiations may feel that the increase may not be what they would like to settle for, but instead that it is the most they can get under the circumstances. That side may also feel that financial gains from the proposed wage increase would potentially be cancelled out by the cost of prolonging the disagreement any further. 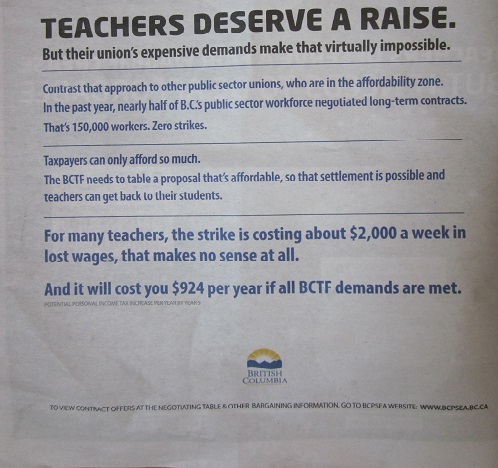 The second page of the ad claims that “[I]t will cost you $924 per year if all BCTF demands are met”. Below that statement, in smaller and much lighter type, is a line reading “potential personal income tax increase per year by year 5”. There is no information in the ad or on the BCPSEA website (where the ad directs readers to go for “other bargaining information”) about how this figure was calculated. However, as any economist will tell you, past financial performance is not always a reliable indicator of future financial performance. It seems highly unlikely that the entire cost of meeting the BCTF’s wage demands would only come out of personal income tax revenues; Statistics Canada’s most recent data indicate that only 15% of BC’s total provincial revenue comes from personal income tax. Tax rates might change over those five years, as might the amount of provincial government revenues from other sources; the provincial government’s expenditures on other cost items might also change. So framing this cost solely in the context of its potential impact on the individual taxpayer gives an unbalanced picture of the situation. Finally, the “outer space” setting of the ad – a setting which was also alluded to in some of Fassbender’s own public comments – also should not go unnoticed. The BCTF and the provincial government have a difficult history with each other, and the BCTF has also undertaken questionable public actions, such as directing unnecessarily personal barbs toward individuals on the other side of these disputes. The government has indicated that it wants to explore ways to improve its bargaining relationship with the BCTF – but meaningful long-term improvements of any kind are not likely to happen until both parties start treating each other with more respect and professionalism. Portraying one party’s bargaining demands as being “lost in space” is not a positive contribution toward improving this toxic relationship.